Imagine that there is a disease that claims more than 30,000 lives in the United States each year. Imagine that countless more people survive this disease, and that many of them have long-lasting effects. Imagine that there are various methods for preventing the disease, but there are social, political, and other barriers to implementing these preventive measures. And then imagine that the Centers for Disease Control and Prevention (CDC) is restricted from, or not funded for, performing research on the disease or how it can be prevented. Unimaginable. But all this describes firearm deaths and injuries in the United States and the congressional ban on CDC performing research on gun-related morbidity and mortality. Each year, about 33,000 people in the United States die of gunshot wounds. The US firearm-related mortality rate is more than five times higher than in Canada, 10 times higher than in Germany, and 40 times higher than in the United Kingdom. Those who survive gunshot wounds often face physical and psychological problems for the rest of their lives. Although more scientific research is needed, we know that restricting access to firearms would reduce gun-related deaths and injuries. But for more than two decades, the CDC has been restricted from performing research on firearm-related deaths and injuries. This restriction is a result of the gun lobby’s profound influence on Congress. The CDC performs its own research and funds much research at many academic institutions on many diseases and injuries of public health importance – from HIV/AIDS to Ebola, from influenza to hospital-acquired infections, from motor-vehicle injuries to tobacco-related diseases. Much of this research is epidemiological, examining the distribution (by time, place, person, and circumstances) and determinants (causes) of disease and injury in populations. Much of this research evaluates alternative approaches to preventing a disease or injury and minimizing its consequences by various forms of intervention. 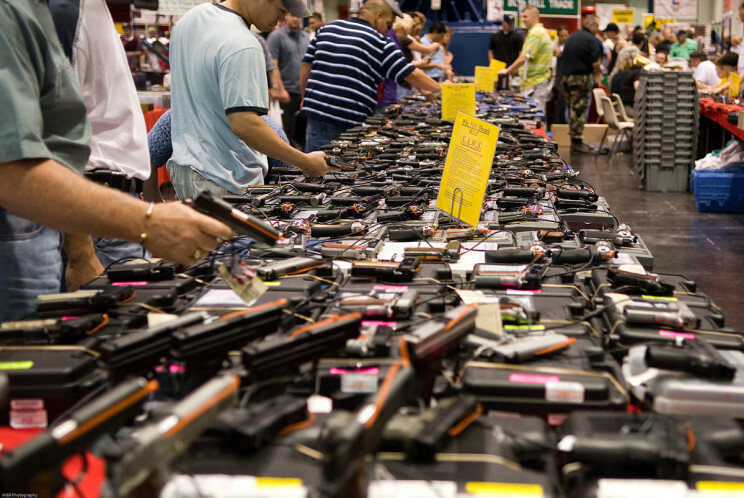 Houston gun show at the George R. Brown Convention Center. Photo by M&R Glasgow. CC BY 2.0 via Wikimedia Commons. When it comes to gun-related injuries and deaths, however, the CDC is not permitted to perform research. This is outrageous in 2016 in the richest country, which has, by far, the highest rate of gun-related deaths among industrialized countries. It is as outlandish as the American Hospital Association hypothetically preventing CDC research on hospital-acquired infections, or automobile manufacturers preventing CDC research on motor-vehicle deaths and injuries, or cigarette manufacturers preventing CDC research on tobacco-related diseases. Gun-related deaths will not disappear if we, as a nation, continue to keep our heads in the ground. There are many common-sense measures that could be implemented to reduce gun-related deaths and nonfatal injuries. These measures include preventing people with mental illness from acquiring guns, banning civilian access to military ordnance, and mandating trigger locks and other forms of gun safety. We are much smarter preventing unauthorized use of smart phones than we are in preventing unauthorized use of firearms. Variants of all of these and other measures are being implemented in other countries that have far-lower rates of gun-related morbidity and mortality. None of these measures represent attempts by the government to make possession of guns illegal. A cornerstone of public health is prevention. Another cornerstone is evaluation of the effectiveness of therapeutic and preventive interventions. Much needs to be done to prevent gun-related deaths and injuries in the United States. At the same time, research needs to be done to identify populations that are especially vulnerable and to assess the effectiveness of various preventive interventions. CDC is the nation’s prevention agency. Preventing gun-related morbidity and mortality requires the active participation of CDC. But right now politics is being given priority over public health. Imagine that this ban can – and will – be lifted. Then take action to ensure that this happens. Imagine how many deaths and injuries can – and will – be prevented. Featured image credit: evidence by Benedict Benedict. CC BY 2.0 via Flickr. 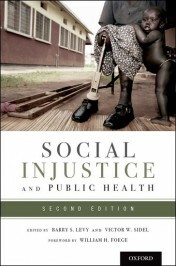 Barry S. Levy, M.D., M.P.H., and Victor W. Sidel, M.D., are co-editors of two editions each of the books War and Public Health, Terrorism and Public Health, and Social Injustice and Public Health, all of which have been published by Oxford University Press. They are both past presidents of the American Public Health Association. Dr. Levy is an Adjunct Professor of Public Health at Tufts University School of Medicine. Dr. Sidel is Distinguished University Professor of Social Medicine Emeritus at Montefiore Medical Center and Albert Einstein Medical College and an Adjunct Professor of Medical Ethics in Medicine and an Adjunct Professor of Healthcare Policy and Research at Weill Cornell Medical College. Imagine a disease where every person who wants to vote for legislation against owning guns is now given a scientific budget to come up with statistics to support more gun bans. There’s a disease I’d like to see cured. Study the mental health of criminals and those in need of care – that guns are involved in 30000 suicides and other deaths seems like studying cars to solve the “disease” of road rage. It’s not the guns, it’s the people the CDC should be studying – and they don’t need an anti-gun monicker and budget to do it. Failed schools (and lowering standards is not a fix). Every year, over 1.2 million students drop out of high school in the United States. And, how many uneducated illegals do we add each year? Local factories that use to employ, moved overseas, so we can buy goods cheaper, but at what cost to the community? One parent families becoming the norm. Two parent families married or not bring family stability and in many case doubles family income. Gang members in many communities treated as family. Revolving door justice, especial when it comes to violent crime. How many times do we find the bad guy had six arrest and still on the streets? How sad that the distortions, omissions, and outright misrepresentations about the 1997 defunding of CDC’s anti-gun advocacy are perpetuated in journals like this. I was one of three medical doctors who testified before Congress in 1996 about the CDC’s blatant gun control advocacy, financed by Americans’ tax dollars. Read our testimony in this week’s blog entry at drgo.us , the first time this testimony has been made public. Learn some truth for a change.